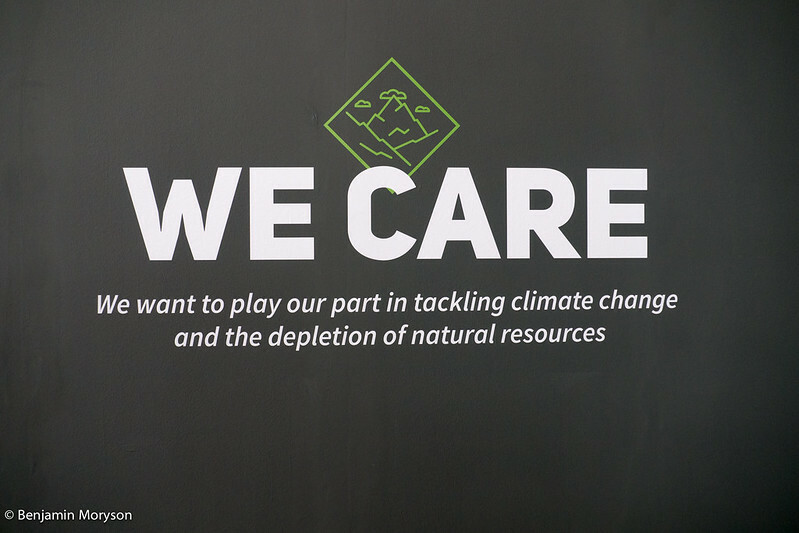 My first meeting was directly on Wednesday morning at the booth of Arc’teryx. 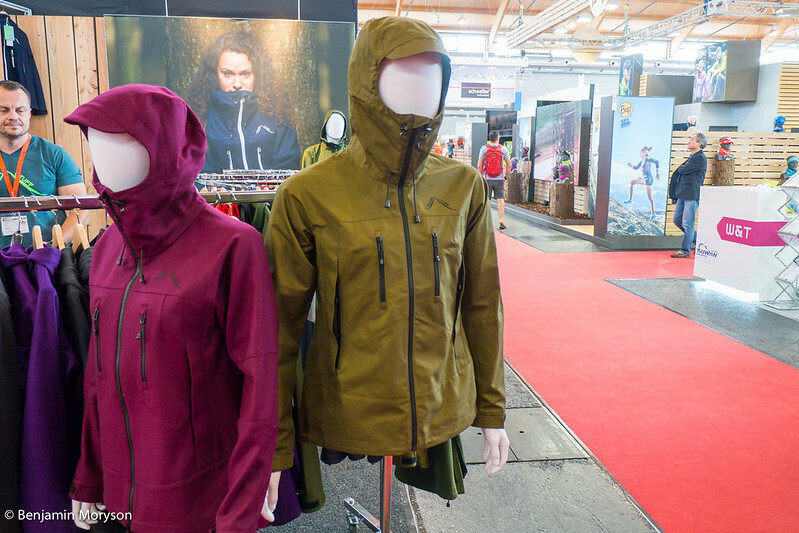 We were five people from the press and got a launch of the new gear together with the designer from Arc’teryx. 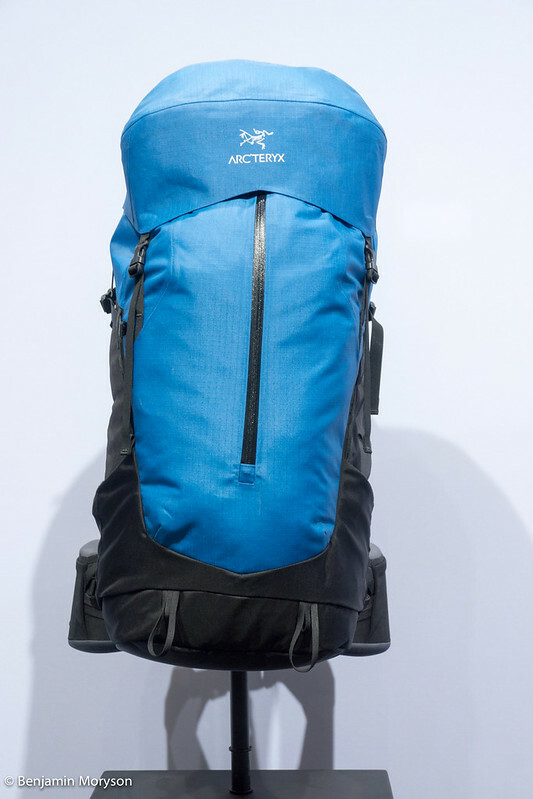 In 2017 the Arc‘teryx Bora AR pack will be back with some great new features. The old Bora was an outstanding pack, but the new Bora AR innovates again with the RotoGlide system that is another paradigm shift in carry comfort. Paired with the new Tegris back panel, the new Bora has more freedom of movement and comfort than any other pack on the market. Check out a video of the presentation. 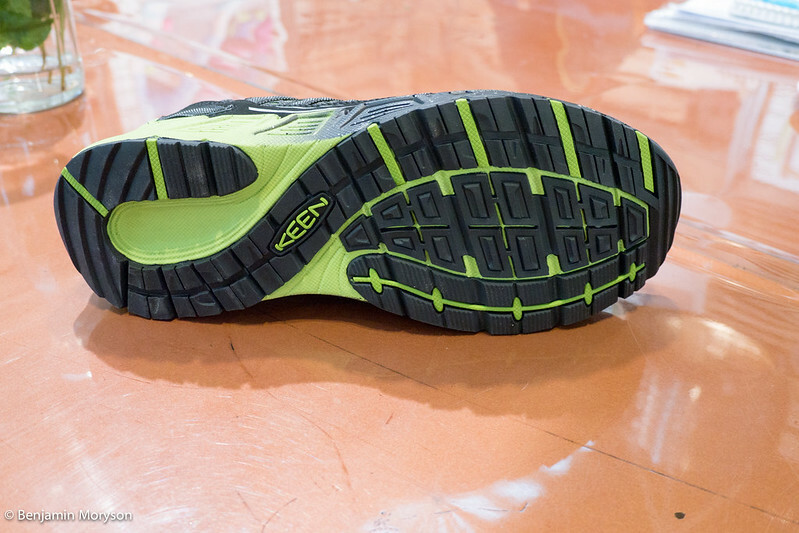 Next we were introduced into the brand new trail running shoe the Arc’teryx Norvan VT. At the first the was a short summary how and why Arc’teryx built this shoe, because they are not the classic trail running company. 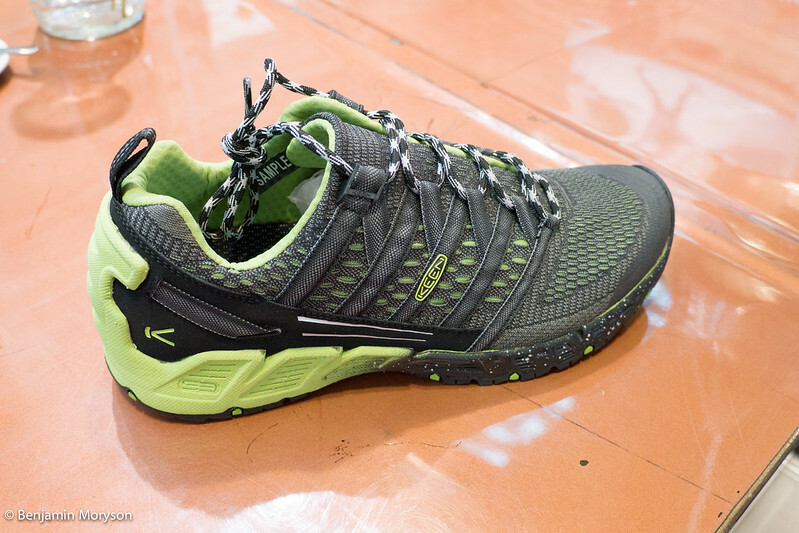 The Norvan VT is a high performance trail running shoe with enhanced scrambling capabilities. 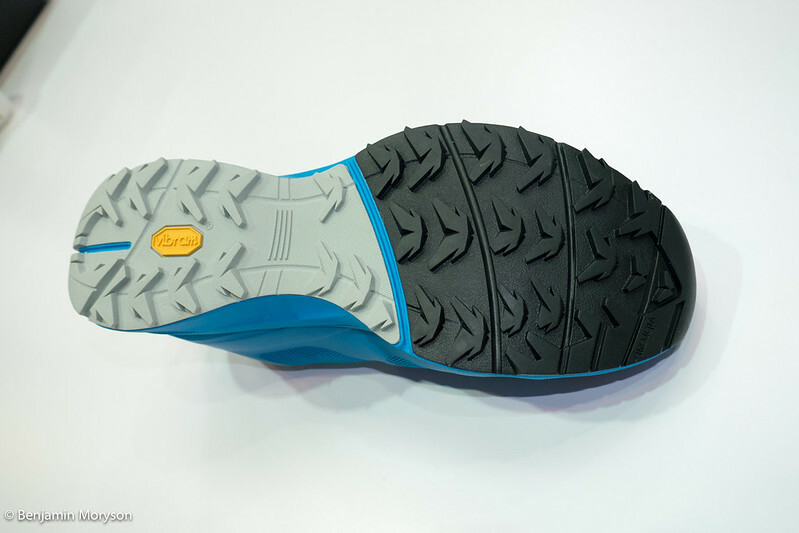 The Advanced Vibram sole combines a sticky Idrogrip forefoot for traction on slick rock and wet trails, with a Megagrip compound for durability and sure-footedness. With the special lacing system you can switch from a higher volume running mode to the precise fit climbing mode. A fixed adaptive liner comfortably wraps the foot and keeps out little stones. The hardwearing materials and a perfect construction protect the foot in rugged landscapes. 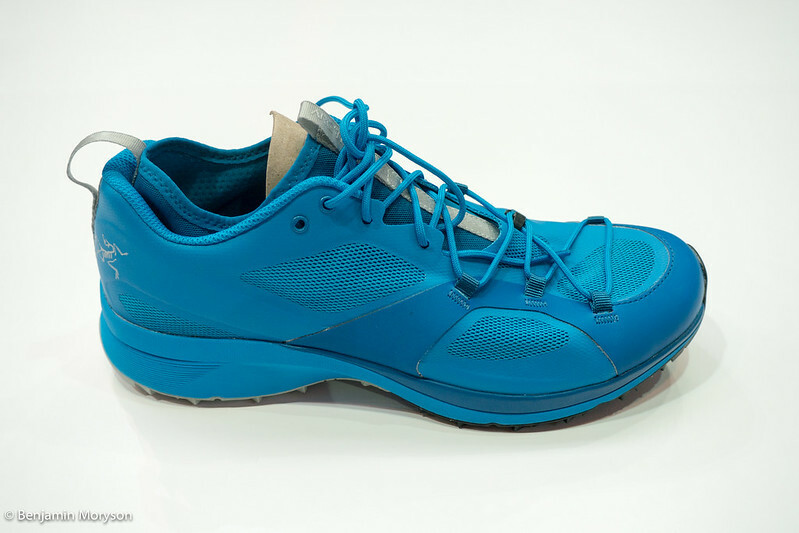 These shoes will be available for men and women and in standard and Gore-Tex. Weight of the shoe is 300g in size 9. 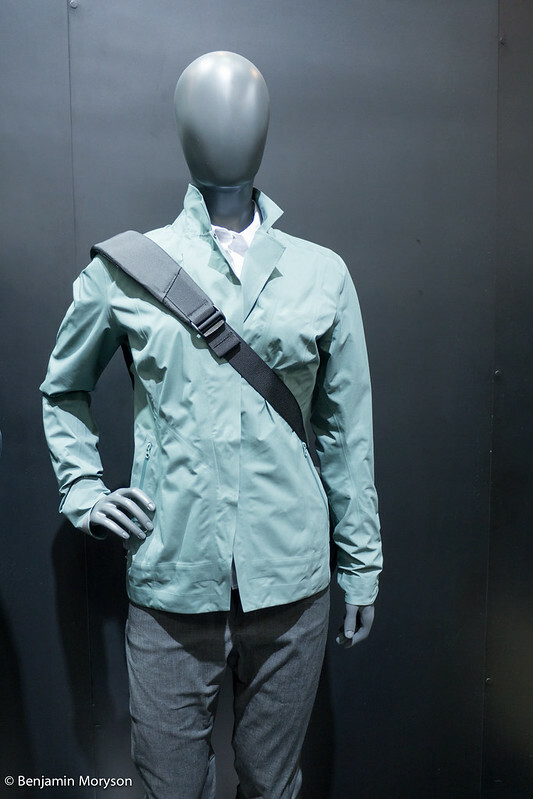 Another highlight is the A2B Hardshell Blazer which is designed for urban commutes and has no zipper. The RS lapel system is a zipperless waterproof closure system constructed to channel water away from the main jacket opening. Other gimmicks of the blazer are integrated stowable reflective surfaces on cuffs and under collar and a back venting system for better temperature regulation. 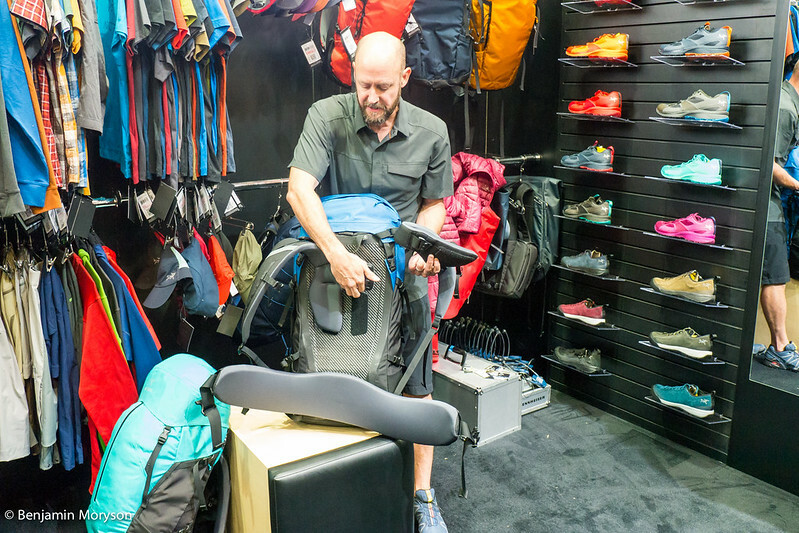 If you are you looking for waterproof and bombproof packs and cases, Ortlieb would be my first address, but these packs did not catch my attention primarily. 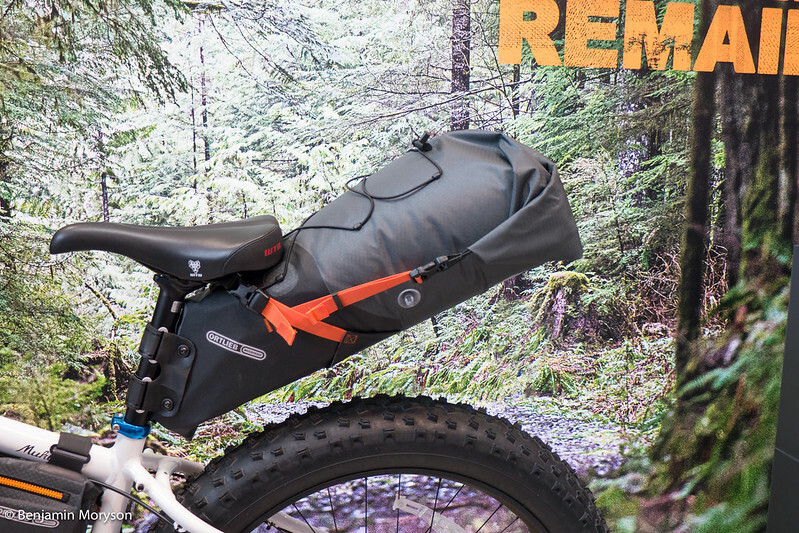 Ortlieb goes into bikepacking and while I am a happy owner of a fatbike, these bags are really interesting for. 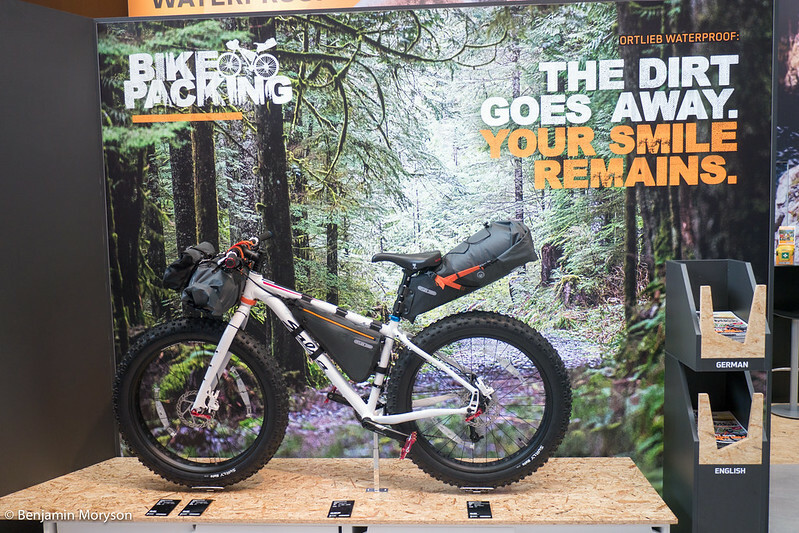 All bags were fixed on a 2015 Salsa Mukluk which means you get a complete backpacking setup. At first there is the 15l handlebar bag with a attaching system which allows you to fix it on several handlebars without any problem. If this handlebar bag is not enough you expand the cockpit with an accessories bag with 3,5l to store snacks, your smartphone or a headlamp. The seat-bag is the biggest pack of all with a maximum volume of 16,5l which can be strapped down to 8l when you do not wanna carry to much. Reinforcements make the seat-bag extra stable that it stays in plays and at the same time it acts as a protective sheet to hold dirt away from your clothing. A small valve also helps you to get the air out of the bag for a small pack size. On top you have some elastic cord to fix wet clothing or other things. Last but not least there is the frame-bag which is available in 2017 in size M (4l) and L (6l). A long zipper gives you access to everything what is in your frame-bag and with the velcro you can fix it on several bikes. All bags are IP64 certified and complete waterproof and complete free of PVC. 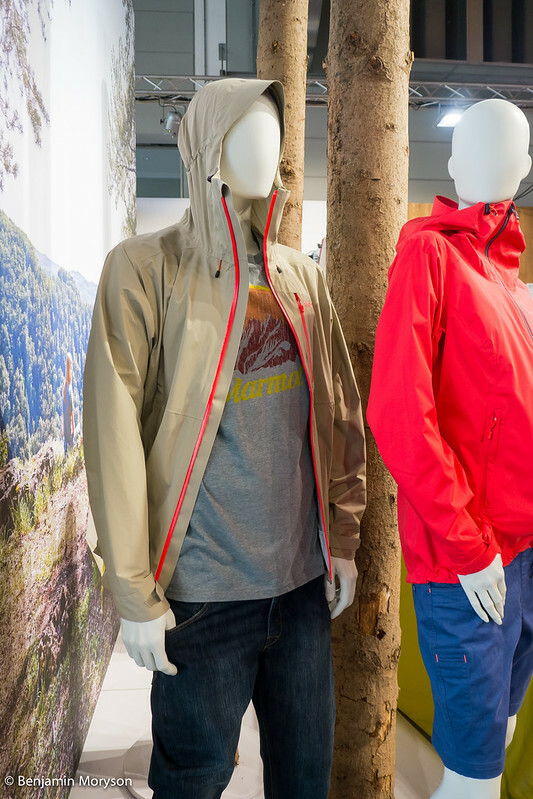 The Knife Edge Jacket with Gore-Tex® Paclite technology is a sign of Marmot‘s continued successful partnership with the membrane manufacturer. This technical, high performance jacket is extra light and has a slightly longer cut with high set pockets, which ideal for climbing, mountaineering or via ferrata. The extensively proven NanoPro collection is expanded with the addition of the Magus Jacket a stretch model that provides superb freedom of movement. This is a versatile, all propose jacket with an adjustable hood, pit zips, a zippered chest pocket hand pocket and an adjustable hem. In addition, it should be mentioned, the new Air Lite Jacket. This jacket weighs only slightly more than 100g. 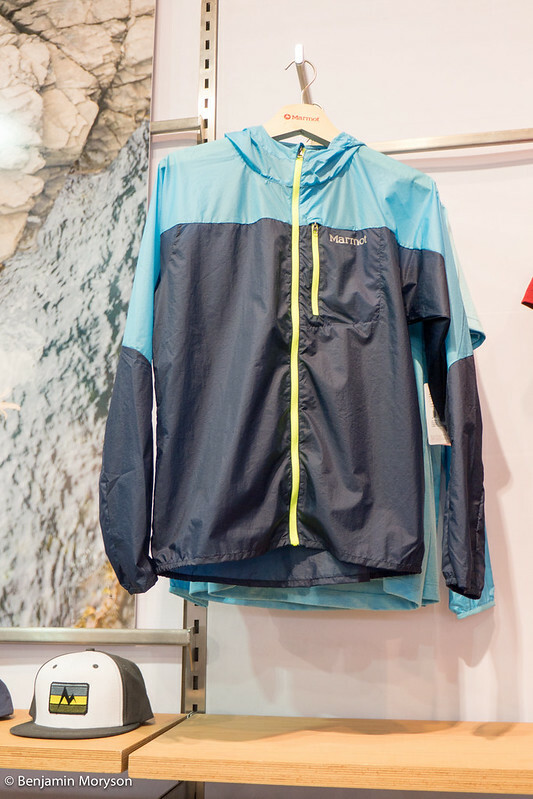 It packs down small in its own stash pocket and with its high breathability and its water- and wind-repellent finish, it is perfect for use as a running jacket or as an emergency backup jacket. The stretch fabric promotes a maximum freedom of movement. 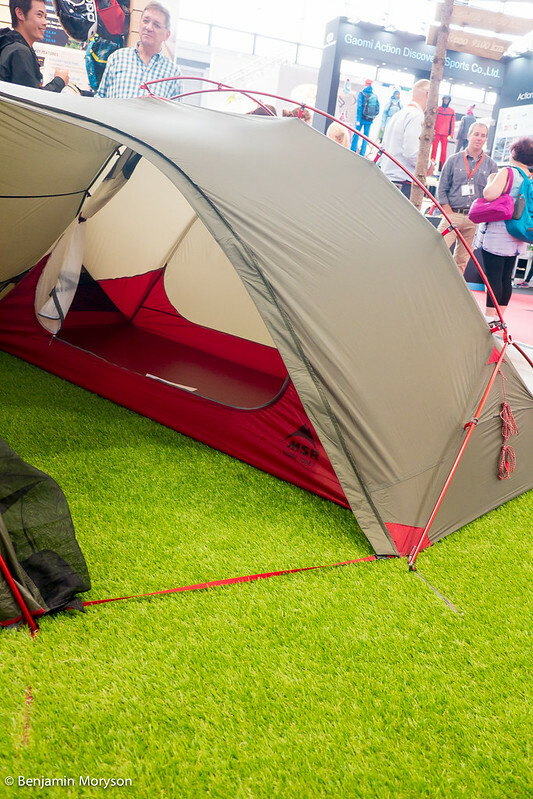 The new Bolt 2P is a tent with a maximum space and a minimum weight. Despite weighing just 1040g, the the sophisticated design and the positioning of the clips make the tent walls a steeper angle, which creates more internal space and more headroom. Even when it is wet it retains its shape very well and the 20D fly is also UV-resistant. The spacious entrance allows effortless access and color coded clips ensure uncomplicated pitching. 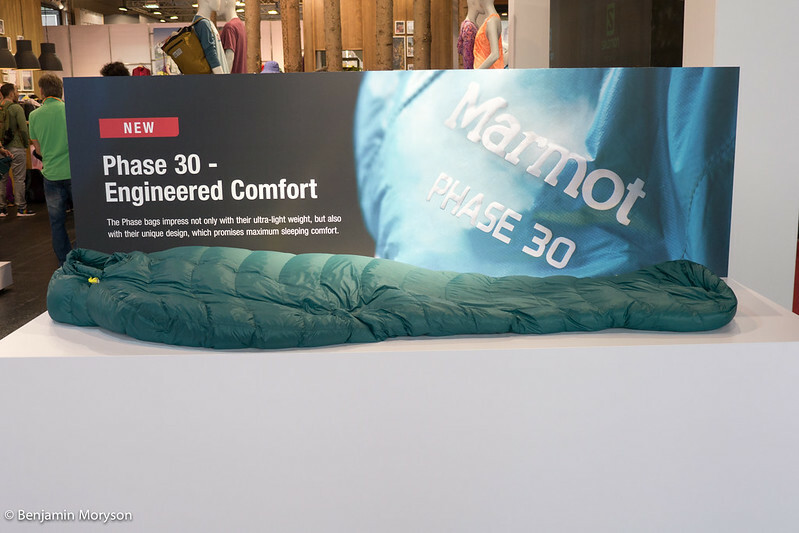 With the Phase 30/20 series, Marmot sets a completely new standard of technology in sleeping bag production. These bags impress not only with their ultralight weight, but also with their unique design which promises maximum sleeping comfort. The anatomically shaped foot box and the 3D hoo ensure warmth und roominess. This high quality bag is filled with 850 RDS certified down which is treated with PFC-free Down Defender against moisture. On the outside there is a 10D nylon ripstop. The Phase 30 weighs 500g and the Phase 20 660g and the womens Phase 20 820g. Last but not least it should be noted that Marmot is now into Phase 2 of the elimination of all PFC from the supply chain.Currently for spring 2017 they have been able to convert or eliminate PFC from 68% of all their products with no impact to performance or durability and the goal is to bee PFC free in 2019. All of the down they used for sleeping bags and 99% of the down they used for apparel for the spring 2017 collection is RDS (Responsible Down Standard) certified and the goal is to get 100% of the down RDS certified by fall 2017. Making a good coffee on tour with fresh beans is difficult, because you need a grinder, and a brewing system. The Cafflano All-In-One Coffee Maker combines alls these things. You only need hot water. On top there is a cover which is time resembled a measuring cup. 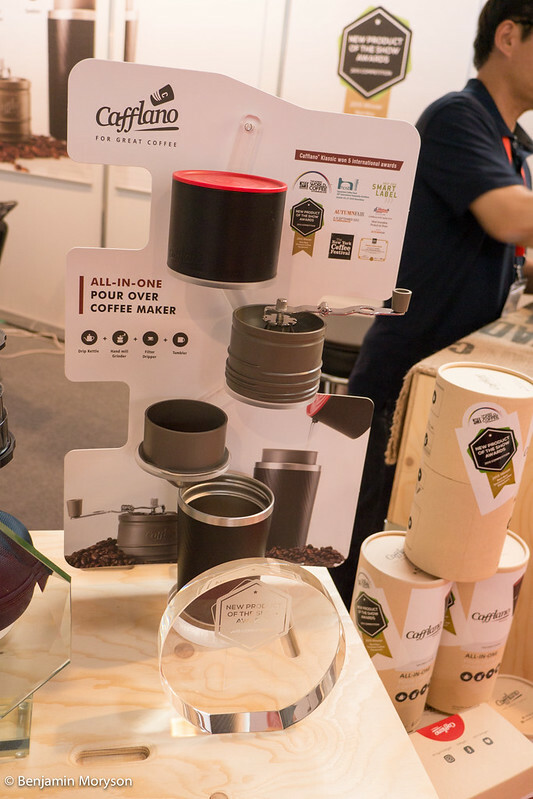 The next part is the grinder with a foldable handle to minimize space. Then you have a permanent and easily washable stainless steel filter. AT least you have a silicon paced stainless steel tumbler with a maximum capacity of 450ml for a double cup of coffee. There full set weighs 470g. For those who like it a bit more simple there is the Simple Pressing Hot & Cold Brewer. This system is a bit easier, because you do not need to grind your coffee. You only have to put grinded coffee into a micro filter and add hot water and everything got mixed in the bellow chamber. 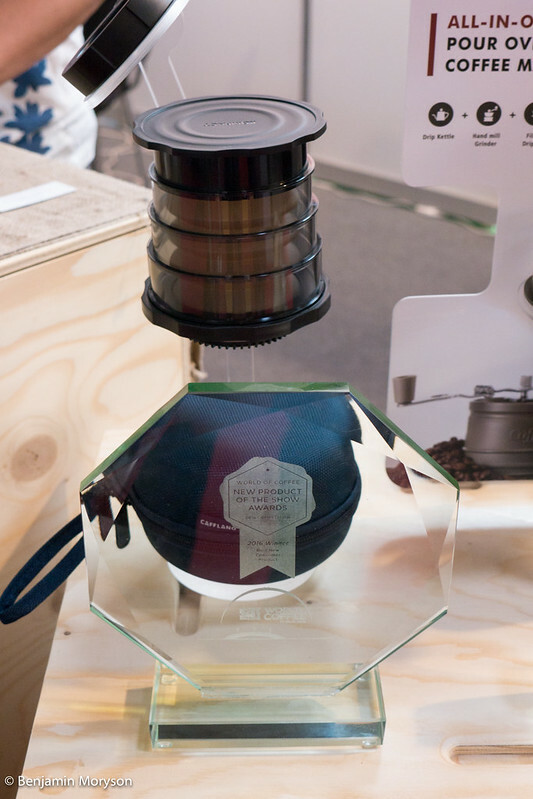 After that you can extract the coffee by pressing the bellow chamber. 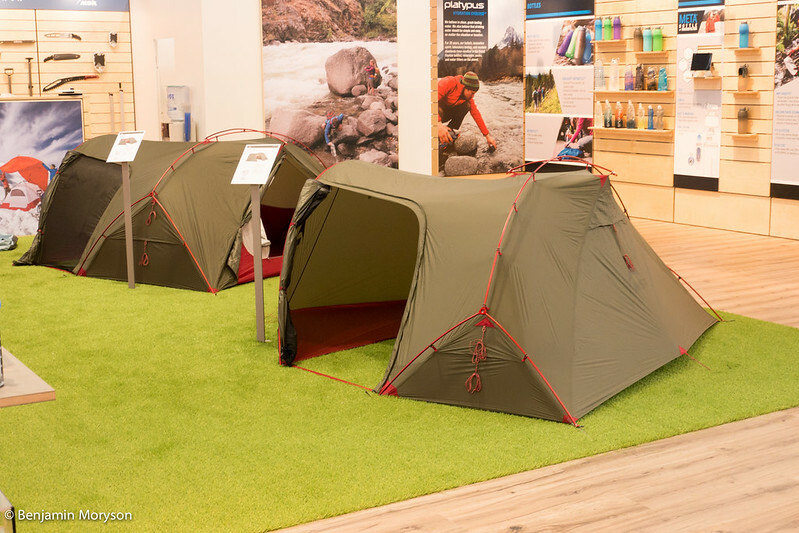 Every year there is a battle which company presents the lightest tent on the market. 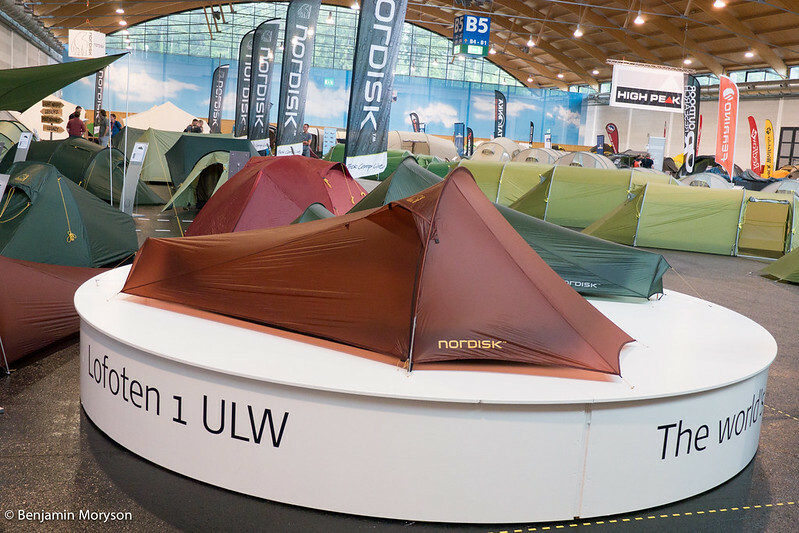 This year Nordisk got the first place with the Lofoten 1 ULW. 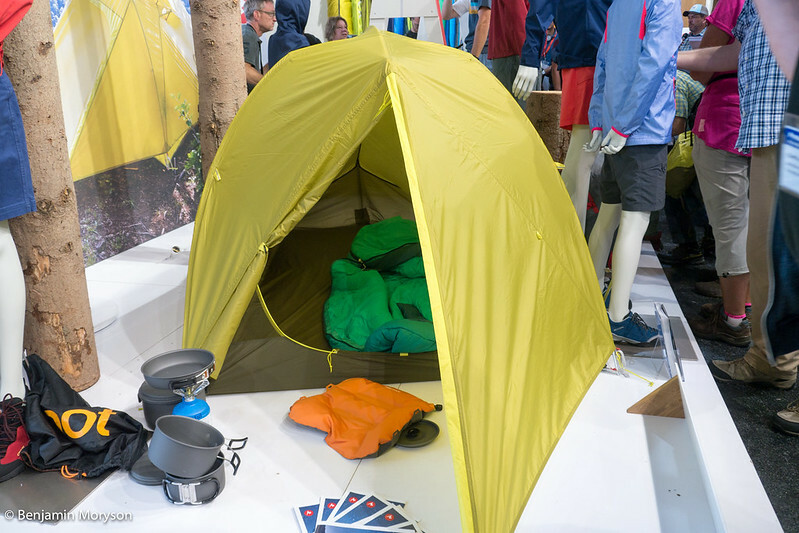 The tent is available as 1 or 2-person version and has a tiny pack size of 11x22cm in the solo version. It is made with a ultra thin and lightweight 7D silicon coated nylon and the pole construction is specially developed to ensure a tiny pack size. This two layer tent comes along with mesh doors, dyneema cords and titanium pegs and the weight of 490 in the solo version also includes a repair kit. The 2 person tent weighs 575g. But this tent is in my opinion only a emergency tent or for really small people, because you only have a height of 70cm in the inner which makes it difficult to sit in. The guys from Roughstuff are back with fantastic new gear. For girls they have now a laden vest with is similar to the mens one only with a girls cut. But the biggest news is a Etaproof jacket. For this jacket they used the successful Deubelskerl cut. For those who do not know Etaproof is a water- and windproof cotton which comes along without any coating. Sorry that there are no more informations, but the first samples of this jacket arrived only a few days before the OutDoor Show. If there are more infos I will write some notes here. Coming now to Cascade Designs which includes the companies from MSR, Therm-A-Rest, Platypus, Sealing, Case and Packtowl. 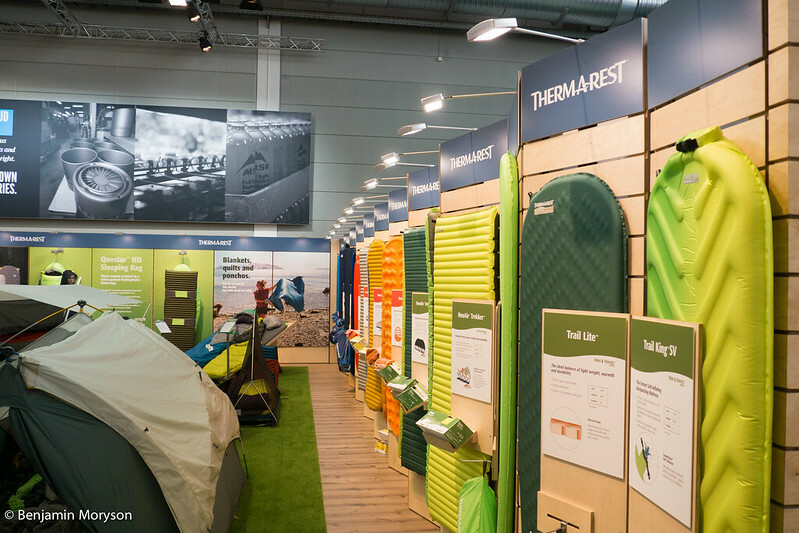 Let’s start with Therm-A-Rest my favorite sleeping mat company. The only new sleeping mat for 2017 is not very light, but very comfortable and perfect for good dreams. 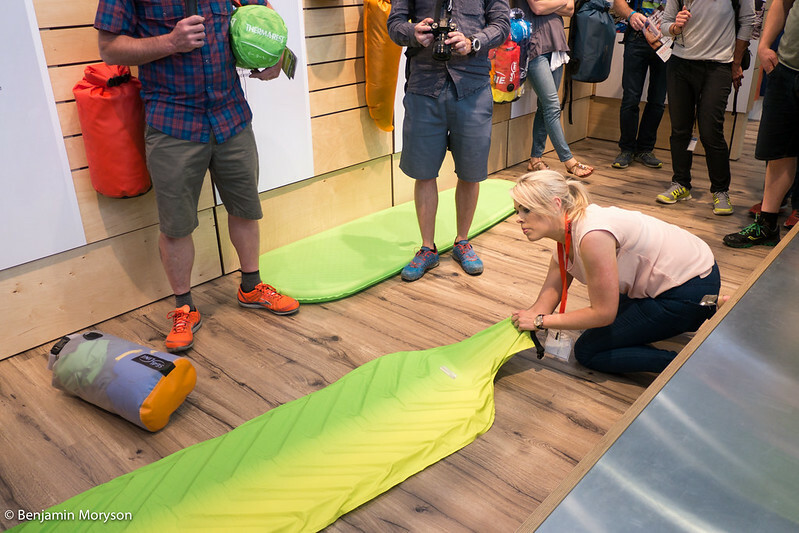 The Trail King SV is a luxurious self-inflatingsleeping mat for backpacker. With the combination of the AirFrame construction, which alternates foam and air channels and the SpeedValve technology this mat is bloat quickly and deflates quickly as we. The weight for the regular one with a r-value is 830g. 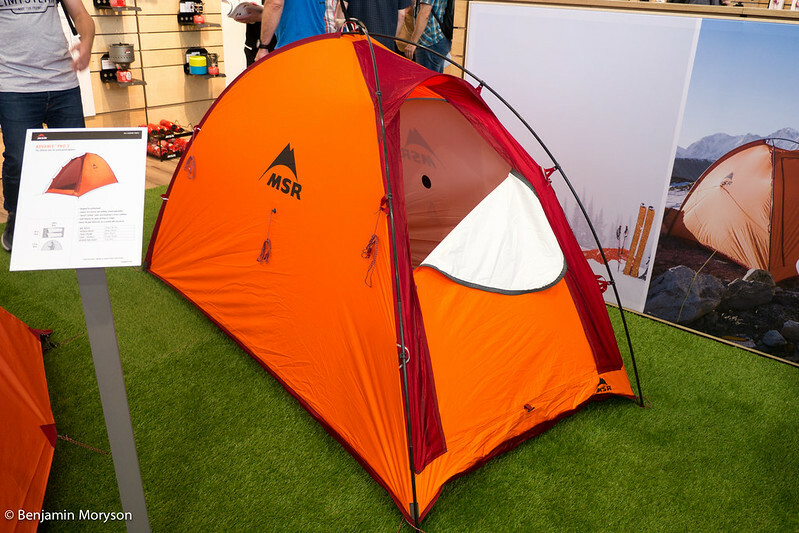 Coming now to MSR where you can find a big range of new tents, but I only wann pick up two for a closer look. At first there is the Hubba Tour which is available as 1 and 2 person tent. One benefit of this tent is that the poles are fixed on the outside and the inner stays dry when you pitch it. The big entrance allows you to store wet clothing or even a bike during the night. For more comfort you have lots of pockets to store your gear. The Hubba Tour 1 weighs 2030g and the Hubba Tour 2 2470g. The large contrast to the Hubba Tour is the MSR Advance Pro 2. This tent is made for alpinists who need a strong tent with less weight. The Easton Syclone poles are made with from a carbon and aluminum composite and they are very flexible. The flysheet is a special one, because it is breathable. It is very easy to pitch and you need just a little place in the mountains to pitch this 1320g tent. The retail price will be around 585€ and it is available in spring 2017. The MSR PocketRocket 2 is the new stage of development of an successful gas stove, because the new PocketRocket is more compact and stable as its predecessor. One liter of water boils in 3,5 minutes and the complete stove is 20% smaller than the old one. 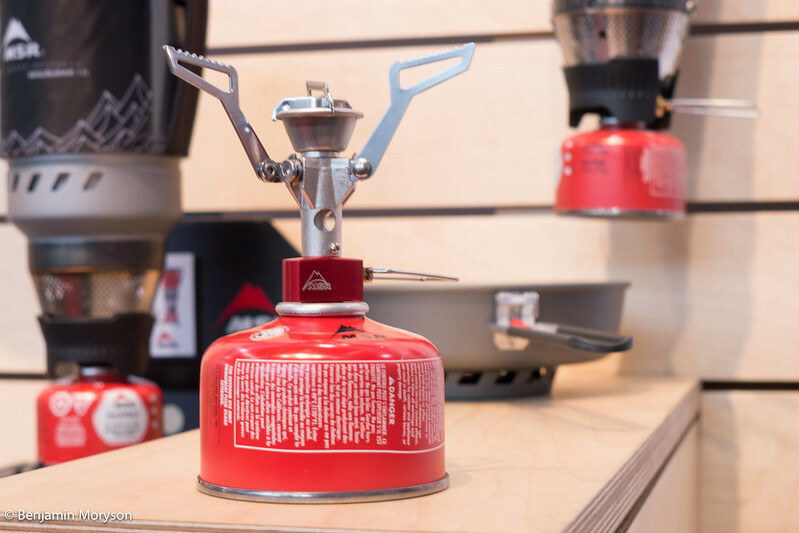 With the new and stronger pot support, you can use different sizes of pots on these 73g heavy gas stove. Coming now to the brand ne MSR Trailshot Mikrofilter which was made for runners, mountain biker and hiker. If you do not carry extra water with you this filter is the best and fastest way to get clean water. The filter consists of a hose and the filter and the only thing you have to do is to put the hose into a stream or a lake and squeeze the filter. Now the water flows through the filter and and cleaned water comes out at the mouth piece. 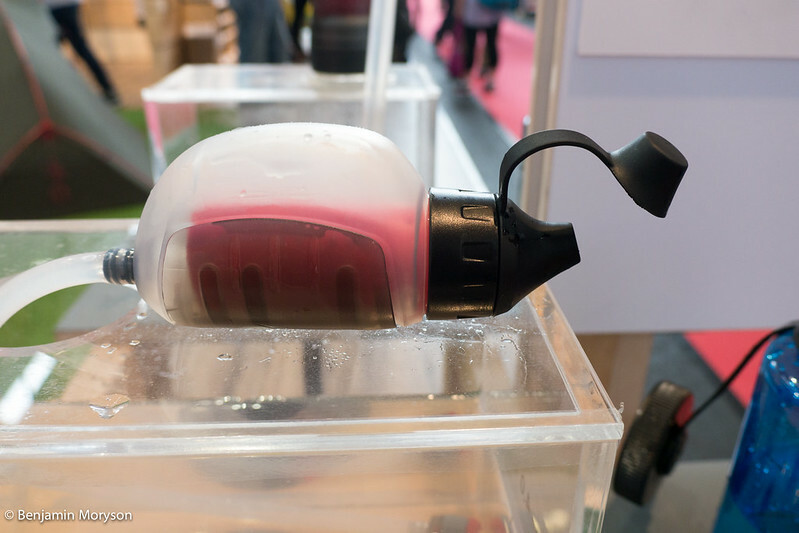 You can fill the water in a bottle or you can directly drink. The filter takes out bacteria, protozoa and particulate and has a flow rate of 1l per minute. With this 146 g Trailshot Mikrofilter you can treat up around 2000l of water. Keen was not on my focus in the years before, but this year I made a stop at their booth to see all these cool shoes. I would like to emphasize one shoe the Keen Versago. This shoe has integrated tongue construction for a sock-like fit and is made with mesh for an optimum breathability. In the midsole they use the S3-Technology for structure, stability and the best suspension on terrain and the non marking rubber outsole leaves no trace. The exterior heel contour gives you a flexible stability. All in all the Keen Versago combines the superb look of a shoe for urban use with technial details which makes him perfect for running and hiking. 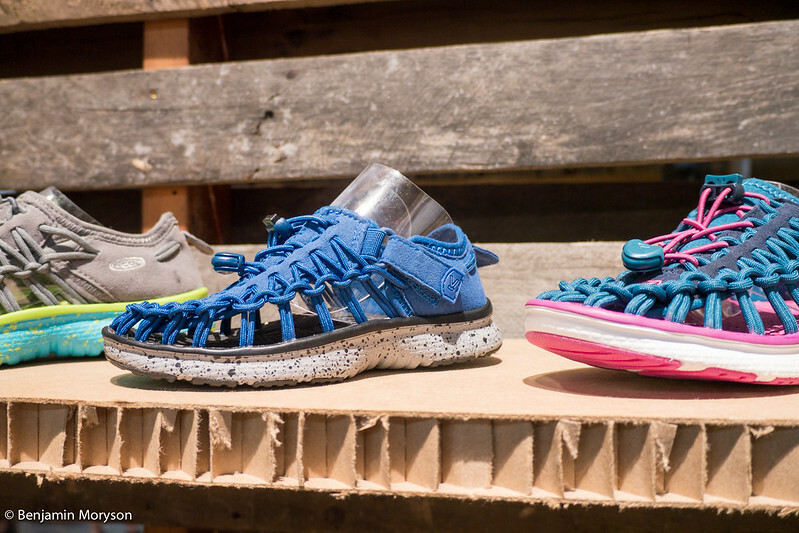 I also wanna mention that the really cool Keen Uneek shoes will be available for kids. You can also follow me on Twitter, Instagram and Facebook to get more outdoor relevant informations.